This recipe is modified from a recipe for Greek Almond Crescents that appeared in the Australian Women's Weekly. It is moist and chewy, and can be altered to fir your mood. optional- shredded coconut, sliced almond, raisins, etc. In a large bowl, lightly beat the egg whites, then add the almond extract and honey and beat a little longer. Gently stir in 3 1/2 cups almond flour to form a thick paste. The dough should be thick enough to be rolled into a ball. If it isn't, add more almond flour (up to about 4 cups). If the dough is still too soft, refrigerate it for an hour or two. Some of you may want to use less honey, in which case less almond flour will be needed. Roll the dough into balls about 1 inch across, roll in sliced almonds or shredded coconut if desired, then roll into a log and form a crescent shape. Place on a cookie sheet that has been lined with parchment paper. Bake 15-20 minutes, depending on how soft or crunchy you prefer these. Raisins or other dried fruit (chopped) can be added after the almond flour. The almond extract could be replaced with another flavor, such as lemon or orange extract. The dough can be made into various shapes or letters, or just squashed flat to make a circle. Part of the almond flour could be replaces with other ground nuts or seeds. This is the recipe I've been looking for! I recently enjoyed a similar Greek pastry using egg whites and "almond paste" and sugar. I wanted to make it with honey instead, and I couldn't find an almond paste sans sugar. I'm totally making these! Thank you so much! yum. 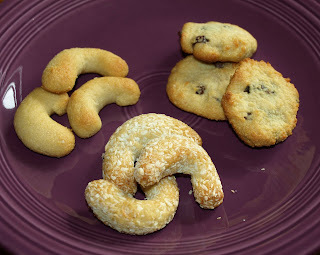 my grandmother made a similar cookie, it was viennesse, and delicious! i might just have to try this soon. is there a reason to not use the whole egg? just curious. I think that the egg white acts as a binder. The yolk acts as an emulsifier and of course adds richness. My guess is that these would be heavier with the yolks. Speculation, but there you go. This is Sierra's post, so she might have other ideas. Thanks Teri, your guess about the eggs is probably right. I used Bob's Red Mill almond flour but have heard that Lucy's Kitchen sells one that is finer. Is almond extract legal? I've never heard that it is ok..Really? Almond extract isn't listed on the official legal/illegal list for SCD, so I've been going under the assumption that if all of the ingredients are okay, it's okay. We use the Flavorganics brand it seems to work well for us. Please let me know if you find out otherwise!